Yes, innerkitten ( love your name,btw! totally get it)...you've got the eye. you are 100% right. and no amount of polishing changes sleepy kashmir to vivid. innerkitten and rockysalamander like this. ok, I was going to let this lie...but here's the contrast using two other sapphires, not mine. the first is a pseudo Kashmir, the second one is real. see the difference? My jeweler insisted it was not polished. Another thing, the sapphire doesn't fit back into its old setting, which I still have. it's cut slightly deeper on one side. and lastly, the surface collects oil and dust like crazy and stays oily, the other one did not. there's a difference in electric charge or something. ....and remember this stone was gone for seven weeks. What was the sequence of handoffs on your sapphire; it went from you>Jeweler>cutter>lab>Jeweler>you? Nobody does a polish on any stone without permission on any stone, let alone a valuable stone. You may clean a stone buy never every polish or alter the stone without full authorization. Did you ask the jeweler if the person who evaluated it for a polish has records of the dings/scratches they evaluated? Can that same person examine the stone you have to determine if they are the same or different? If this was a swapped stone, it would either be perfect (no age marks) or have very new damage. You can tell a new vs. old chip in sapphires by the edges of the abrasion. Did the jeweler say the stone won't fit in the original setting or you? Prongs are bent outward and lose their "spring" when you remove a stone from a setting (or you'd never get it out). The seats are there, but it takes some work to re-fashion the prongs without enough spring and re-seat the stone. Just sitting a stone in the setting is not the same as a jeweler saying that the seat don't align. elle_71125, lovedogs, innerkitten and 5 others like this. To add to @rockysalamander 's excellent post above, I always review the stone under a microscope with a jeweller (since I don't own any) before mailing it out or leaving it in their care. We both bookmark all the inclusions we find since those are the birthmarks / fingerprints that are almost impossible to duplicate. elle_71125, lovedogs and rockysalamander like this. Are you comparing photos & memories of the set sapphire, with the now-loose sapphire? Is it possible whoever removed the sapphire from the setting tweaked the prongs/setting so that putting the stone back in is not easy? Here's a good description of the Kashmir "silk"
"New sapphires are no longer discovered in Kashmir, and in fact most of the Kashmir sapphire that exists was discovered more than 120 years ago. Kashmir sapphires are so highly valued because the finest specimens have a superb royal blue color and a velvety texture due to fine silk inclusions. Some of the best Burma, Ceylon and Madagascar sapphires come close, but Kashmir sapphire continues to have a nearly mythical reputation in the gemstone world." Here's the sequence: I gave the stone to my jeweler who sent it the next day by Fed Ex insured to her polisher in NYC. The polisher had it for about three days to give me an estimate on the cost of recutting and or polishing. They didn't touch the stone because I sent word back not to and why. I thought it was important not to change the stone for a variety of reasons. It was then given to the lab. Later that week I called the lab to ask how long it would take to do the report, and they said it could be as long as six weeks because their best graders were all in Hong Kong and there was a back-up. I received the stone back 7 weeks later. The report includes the finding that the stone is Kashmir, however, it was only a report for "origin"...and the picture on the paperwork is of the second stone, not the original. I have nothing constructive to say about the identification of your sapphire, but I'm really impressed by the experts here with the "sherlock-holming"/ "CSI-ing" and have learnt lots! And thank you for sharing your Kashmir sapphire! It's so rare that I never thought I would come close to seeing one, and I'm glad to have "seen" one via your photos. Enjoy your gorgeous stone! If you got swapped a fake, I'd think it would HAVE to be a crappier fake than this given the timeframe. Not so exactly matched down to the very facets and blemished. Yes, and this isn't to say the second stone ( assuming a swap) isn't beautiful. It is. I think my best bet is to talk to a cutter and have an expert examine the abrasions which are have sharp edges ( under my microscope) and look new. my sapphire was from 1886, and the abrasions from YEARS of wear are almost softened by minute superficial scratches. This one just looks like someone took a sharp edged tool and dug it in at various places to mimic the other stone. I won’t speak to whether or not the stone could have been switched, but I will say that a dirty stone from finger oils, lotion, etc can take on a sleepy appearance and even alter the look of the tone of color. I have one stone that does this after just one day of wear. I might have missed it somewhere in this thread, but had the stone been cleaned properly, really cleaned good with something that would have dissolved all oils, while in your possession before you sent it away? tigertales, GliderPoss, lovedogs and 2 others like this. My original question isn't so much WAS this done ( we'll probably never know), but CAN it be done. Thank you to the posters who offered amazing insight and info! I'm loving the sapphire, either way, and it was a tremendous gift. Can it be done? Yes, but it will be very difficult to do so. There are many factors (as discussed above) that make it unlikely in your case. I am interested in the follow up nonetheless. lovedogs and 2Neezers like this. Could just be odd reflections but in the original picture looks like table is oriented like a stop sign I.e. flat sides are parallel with the sides of stone whereas on the newer pictures it appears rotated so the the pointed edges align with top/bottom/sides of stone? For what it's worth I copied a picture of both stones and for my own curiosity enlarged them and compared them side to side. IMHO- I am convinced this is the same stone. tigertales, elle_71125 and lovedogs like this. the table is slightly off. yes. Yes, there may be a table difference between the two...it's so very hard to tell at this point. My new stone is lovely, regardless. Ironically, I actually prefer its deeper brighter color. And that's enough of that! Cheers y'all. And again, thanks. I think many people don’t understand that stones are not ‘polished’ or repolished at all similar to how a jeweler will polish your gold. Gold can quickly be buffed to remove scratches and bring out fresh luster. A stone is not buffed. 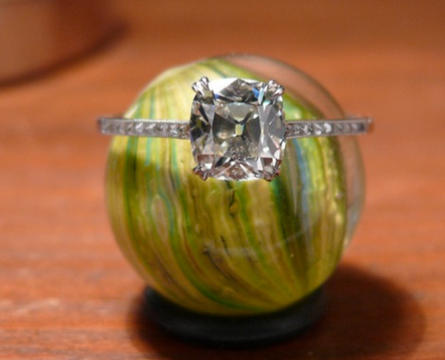 The stone would need to be removed from the setting and then entire crown would be re-cut. To re-cut you need to locate the angle and index for each facet and then slightly recut the facet with maybe an 8000 grit wheel, followed by a finial polish of 14,000 to match commercial cutting, or 50,000 to 100,000 grit for ‘Precision’ standards. This always envolves some loss in weight as material is being removed. It’s also time consuming as the cutter is fishing for the correct angle an index. It takes much longer than cutting a rough stone. Sometimes with stones with just minor wear, the wear is mainly on the table and the adjoining facets. In this case, you can at time just recut the table a little lower and clean the abrasion. This does cause the meets to be off, but to most people they would never notice this. To find a similar stone, and then recut it to the same size with the same facet layout, and then duplicate the scratches on the stone is about the same odds as winning the Mega-lotto jackpot. GeauxGirl, voce, elle_71125 and 16 others like this. I might be wrong but what many of us would like to hear is that we have convinced you. That you believe that your incredible stone has not been switched. The evidence is insurmountable. junebug17, digdeep, Sparkle_ruckle and 4 others like this. I think it’s the same stone just after a very deep bath! junebug17 and 2Neezers like this. I that your opinion, or your dog's?...LOL ! Cause it looked for a second like HE was posting...so cute! Maybe he loves his baths! I think many people don’t understand that stones are not ‘polished’ or repolished at all similar to how a jeweler will polish your gold. Gold can quickly be buffed to remove scratches and bring out fresh luster. A stone is not buffed. The stone would need to be removed from the setting and then entire crown would be re-cut. To re-cut you need to locate the angle and index for each facet and then slightly recut the facet with maybe an 8000 grit wheel, followed by a finial polish of 14,000 to match commercial cutting, or 50,000 to 100,000 grit for ‘Precision’ standards. This always involves some loss in weight as material is being removed. It’s also time consuming as the cutter is fishing for the correct angle an index. It takes much longer than cutting a rough stone. Thank you thank you !!! This is the expertise I was looking for. Just what I needed to hear. So, I guess it's all good. In any case, the sapphire is beautiful no matter what. You can see it in my profile pic, in a setting my husband gave me for Christmas. The previous thread you refer to needs clarification. The two sapphires compared are not only obviously a different colour tone but also importantly one is under 2 carat and one is over 2 carat. The current price guide range for an under 2 carat Kashmir sapphire “fair grade” is between $2,400 and $6,000 per carat. The current price guide range for a 2 to 3 carat “good grade” Kashmir is $7,000 to $17,000 per carat. Looking at both ”your photos” of the “original sapphire” and “currently held” sapphire they are both Kashmir Sapphires and both 2.40 ish carat weight. What I can’t see is a DIFFERENT colour grade, whether that grade be “Very Good” or “Top”. Both are extremely close in colour tone IF you assume they aren’t the same gem. Now you believe your “original” Sapphire was more “silky” and that’s a distinctive and valuable trait of Kashmir sapphires but TOO much silk reduces clarity and therefore value. So technically speaking if the “currently held” sapphire is more transparent ie higher clarity grade then “the original” sapphire, the one you “currently hold” is more likely to be the higher valued gem. So If it were true that you have a different Kashmir Sapphire in your possession, the minute difference in colour would not make one “more valuable” than the other, you need to change colour grade for that to affect price. And the reason why your “currently held” sapphire isn’t fitting perfectly into the original ring mount is because they had to bend out prongs to remove the original sapphire. Wewechew, Sparkle_ruckle, strawrose and 2 others like this. Your original sapphire is a wonky old cut because it's an antique stone. The second stone has the same cut, so if it was switched someone went to an incredible amount of trouble to replicate the first stone. I'd guess it's more likely that the original stone was cleaned and has had a light polish. A switch is not impossible having said that. I recently got a large Burma sapphire recut and repolished and, yes, it did significantly change colour but I lost a few carats in weight. junebug17 and pwsg07 like this. If you don't wish to read the whole thing it basically says that our brains cannot remember hues of color accurately. Not only that, but we tend to remember color on a personal bias towards shades we prefer. Not saying that this is exactly what happened here, but it could perhaps be a contributing factor towards the difference, or perceived difference, in colors. voce, GeauxGirl, LisaRN and 2 others like this.